Soccer, or football as it's usually known in Africa, is followed passionately throughout the continent from Morocco in the far north down to South Africa. You'll know when an important match is being played because it will be all anyone in the country you're visiting can talk about. 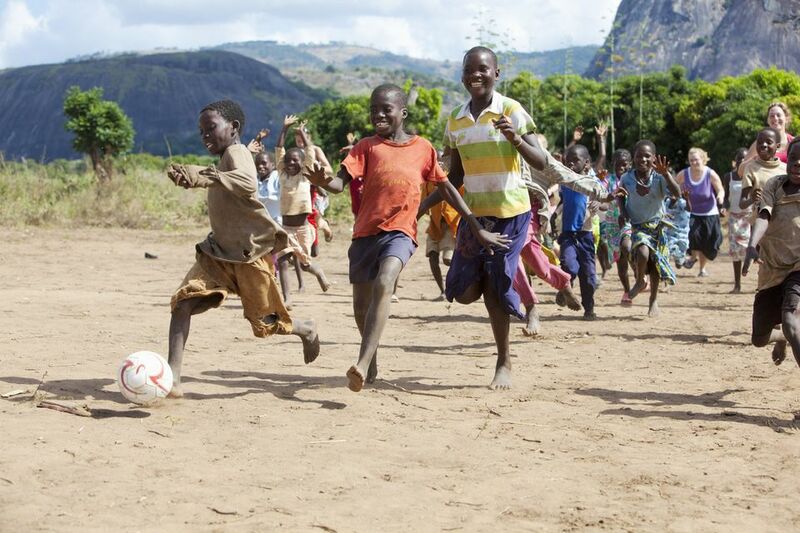 Everywhere you go in Africa you'll see young boys kicking a football around. Sometimes the ball will be a regulation soccer ball and sometimes it will be made of plastic bags with string wrapped around it - but as long as it can be kicked, there will be a game. African national football associations are represented by the Confederation of African Football (CAF), the largest of FIFA's six continental confederations. CAF is allocated five places for the FIFA World Cup (except in 2010, when South Africa was automatically granted a place as the tournament's host country). There are five regional federations of the CAF - North Africa, West Africa, Central Africa, East Africa and Southern Africa. For in-depth information about African national and club teams, statistics and fixtures, visit the CAF website. According to the latest FIFA rankings, the top five African national soccer teams are Senegal (in first place, ranked 23rd in the world), followed by Tunisia, Morocco, Nigeria and the Democratic Republic of Congo respectively. Some of the most competitive rivalries of the African national soccer scene include the one between Nigeria's Super Eagles and Cameroon's The Indomitable Lions; the one between Egypt's The Pharaohs and Algeria's Fennec Foxes; and the one between Ghana's Black Stars and the Ivory Coast's The Elephants. The African continent has produced many exceptional soccer players who have gone on to shine at an international level. Some of the biggest current names include Samuel Eto'o, Yaya Touré and Mohamed Salah. Cameroonian Eto'o is regarded as one of the world's best strikers and is the all-time leading scorer in the history of the Africa Cup of Nations. Along with Touré, he has been named African Footballer of the Year a record four times. Liverpool forward Mohamed Salah is the continent's newest top talent. Named African Footballer of the Year in 2017, he was awarded the Premier League Golden Boot in the same year and is currently the fourth most expensive player in the world. Retired greats include Ivory Coast national hero Didier Drogba, the all-time top scorer for his national team and the fourth-highest goal scorer of all time for Chelsea FC. Liberian player George Weah remains the only African ever to have been awarded the FIFA World Player of the Year and the Ballon d'Or. A man of many talents, he is now serving as Liberia's 25th president. The continent's main international soccer competition is the CAF Africa Cup of Nations. Held every two years, it expanded in 2017 from 16 to 24 participating teams. The teams compete in a series of qualifying matches for their right to take part. There is a women's version: the CAF Africa Women's Cup of Nations. This tournament also takes place biennially and serves as a qualifying tournament for the FIFA Women's World Cup. On years that the CAF Africa Cup of Nations does not take place, the top 16 international teams compete in the Africa Nations Championship. Pan-African club competitions include the CAF Champions League and the CAF Confederation Cup. The final group stage of the Champions League competition is a knock-out tournament featuring 16 of the continent's best club sides. It is Africa's premier club football competition and the winner earns a place at the FIFA Club World Cup. The Confederation Cup is a second-tier competition for which clubs qualify based on their national league rankings. The winners of the Champions League and Confederation Cup competitions face each other in the annual CAF Super Cup. In addition to following African clubs and national teams, many Africans are also passionate followers of European soccer. Wherever your African adventures take you, you're sure to see fans wearing the colors of UEFA Champions League clubs like Barcelona, Liverpool and Manchester United. Teams with African-born stars are especially popular. Being able to talk knowledgeably about your favorite club is a great way to forge new friendships and European soccer shirts are valuable bartering currency at most African markets.